“Red pandas are adorable. And they are in trouble. The International Union for the Conservation of Nature estimates that about 10,000 live in the wild, all on mountain slopes in a narrow band running from western China to Nepal. Deforestation and disease threaten them now, and climate change looms. The I.U.C.N. currently lists red pandas as vulnerable, but some scientists are pushing to have them classified as endangered, the next step up. 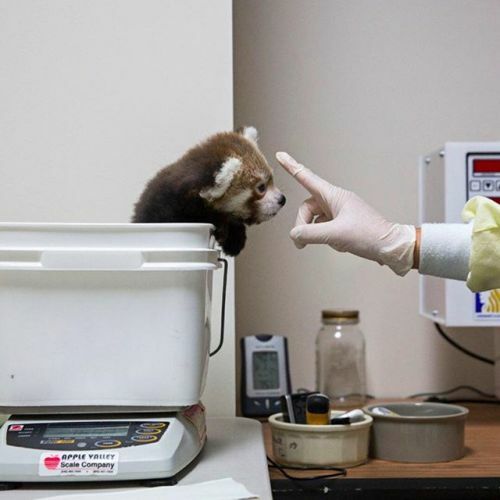 @drewangerer photographed this #redpanda cub being weighed before its 6:30 a.m. feeding at The Smithsonian Conservation Biology Institute in Front Royal, Virginia.” By nytimes on Instagram.